For wine lovers, one of the great joys of travel is getting to visit vineyards and wineries while abroad. It’s about more than sampling the local wines (though don’t get us wrong, that’s important). Visiting vineyards abroad is an opportunity to learn more about the local winemaking industry. There’s no better way to get to know a wine region’s traditions, terroir, and techniques than by speaking to vintners and viticulturists. Wine tastes better when you’ve stood on the soil where vines are grown. That’s why so many of our Cruise Global, Taste Local shore excursions take guests to renowned wineries in the world’s best travel destinations for wine lovers. You’ll find a mix of Old World and New World wine regions on this list. “Old World” refers to destinations like Italy, France, Spain, Portugal, and Greece. These are countries have been producing wine for thousands of years. Here’s a fun fact: did you know that the Caucasus region is known as the birthplace of wine? This area lies at the border of Asia and Europe and includes modern-day Armenia, Azerbaijan, Georgia, and parts of Iran, Russia, and Turkey. “New World” refers to countries that began producing wine after the Age of Exploration. That includes destinations like Australia, New Zealand, the United States, South America, and South Africa. Below are five of the world’s best travel destinations for wine lovers. And the best part is, you can visit all of them by cruise. It should come as no surprise to see France featured on this list! France is home to eleven major wine regions, as well as several smaller regions. To find out the differences among the regions, check out our handy Guide to French Food and Wine. Two of our favorite French wine regions to cruise to are Provence and Bordeaux. 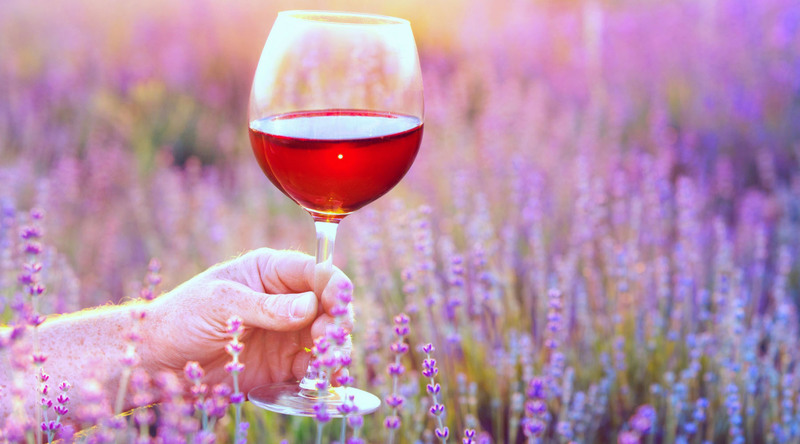 Provence, located in the south of France, is a must-visit travel destination for rosé lovers. It’s the world’s largest producer of rosé wine, and 88% of the wine produced here is rosé. Winemaking has existed in Provence for over 2,500 years – ever since the ancient Greeks founded Marseilles in 600 BC. In addition to being a historic and popular wine region, Provence is a magical place to visit. The luxurious, sun-kissed Cote d’Azur is perfect for cruising, and Marseilles makes an excellent jumping-off point for exploring the region of Provence. It’s impossible not to fall in love with the picturesque lavender fields, historic châteaus, and rustic cuisine. Bordeaux, in the southwest of France, is an ideal travel destination for red wine lovers. Winemaking in the region dates back to the mid-first century when it was introduced to the area by Romans. Over 90% of the wines produced in Bordeaux are red, mainly made with Cabernet Sauvignon and Merlot. In fact, the Cabernet Sauvignon and Merlot vines originated in Bordeaux. Two of our favorite regions to visit within Bordeaux are Sauternes and Graves. Graves is home to the oldest vineyards in the region. Sipping wines in Graves is like drinking in the history of France. Visiting Sauternes is one of the best ways to gain a true appreciation for the unique microclimate of Bordeaux. When you visit Sauternes you'll feel the warm sun on your face, taste the grapes right off the vine, and discover how the rich soil influences the subtle flavors and sweetness of the wine produced here. You can visit both regions during a Cruise Global, Taste Local shore excursion with Azamara. When our ships cruise to Bordeaux, we travel up the Garonne River to the heart of the city. It’s a captivating city to visit. Half of Bordeaux has been classified a UNESCO World Heritage Site, thanks to its enchanting neoclassical architecture and historic cultural relevance. But it’s also a youthful, energetic city with modern buildings designed by renowned architects and a thriving nightlife. Dive into French culture by immersing yourself in the food and wine of the land. You can use our shore excursion finder to browse Cruise Global, Taste Local shore excursions and find the perfect experience for you. This New World wine region didn’t start to take off until the late 1960s but has been rapidly growing ever since. Today, Australia is the fourth largest exporter of wine worldwide. Wine tasting is among the most popular things to do while visiting Australia. There are around 400,000 acres of vines in Australia, mostly clustered around the continent’s southern coast. This makes the destination a perfect fit for cruise travel. What could be more relaxing than sailing from one incredible port to the next on a boutique cruise ship, sampling some of the world’s best wines both onshore and onboard? When planning a trip to Australia, there are a few key areas that wine lovers shouldn’t skip. A wine lover’s trip to Australia wouldn’t be complete without a visit to Adelaide and the nearby Barossa Valley. The Barossa Valley is one of Australia’s most acclaimed wine regions thanks to the big, earthy Shiraz wines produced here. In fact, Shiraz is Australia’s most common varietal. The second-most popular Australian wine is Chardonnay, and fans of that varietal should call on Bunbury and the up-and-coming Margaret River wine region. This is Australia’s coolest wine region, known for boutique wineries that produce limited, but premium wines. Perth is the gateway to Australia’s Swan Valley, a region known for its warm climate and fertile soil in Western Australia. Here, you’ll find small, family-owned wineries that specialize in Shiraz, Chenin Blanc, Verdelho, and Petit Verdot varieties. To truly appreciate Australian wine, drink it on Australian soil. We offer incredible food and wine-focused shore excursions that take guests beyond the typical tasting. When you get to know the people who've been making wine for generations, you sip it with a new appreciation for every ounce of effort that goes into creating the perfect balance of flavors. Check out the amazing food and wine experiences you could incorporate into your next voyage to Australia by visiting our shore excursion finder. From the top of the boot to the heel, Italy produces incredible wine. Visiting vineyards and sampling fine wines are must-do activities when in Italy—and you’ll have plenty of opportunities to do so during a country-intensive voyage. Italy’s wines are as diverse as they are enjoyable. From bold reds to sparkling whites, wine lovers of every kind will find something they like in Italy. Of all the wines, reds are what Italy does best. Two of the best regions for red wine are Piedmont and Tuscany. Before visiting, memorize the three B’s: Brunello, Barolo, and Barbaresco. Brunello di Montalcino wines are produced in the region surrounding the Tuscan town of Montalcino and are made with Sangiovese grapes. Barolo and Barbaresco wines are produced in different parts of Piedmont, using Nebbiolo grapes. All three are among Italy’s most acclaimed wines. Beyond the “three B’s”, Tuscany is also home to famed Chianti and Super Tuscan wines. Super Tuscan is a relatively new wine term with an ever-evolving definition. It developed in the 1970s as a response to strict regulations on what could be classified as a Chianti wine. Super Tuscans deviate from the guidelines that dictate a Chianti wine must be no more than 70% Sangiovese grape and at least 10% local white wine grape. However, today, Super Tuscan is more likely to simply refer to a Tuscan wine blend that includes non-indigenous grapes. Red wine lovers might also enjoy the wines of Sicily. The island’s fertile, volcanic soil produces unique wines like the earthy and light-bodied Nerello Mascalese. For a more full-bodied Sicilian red, try the Nero d’Avola. This dry red will appeal to fans of Syrah or Cabernet Sauvignon. Though Italy’s not as famous for white wine, there are plenty of options for fans to sample. Though Tuscany is famous for reds, the Vernaccia di San Gimignano is often lauded as Italy’s best white wine. In the Abruzzo region, look for white wines that use the Trebbiano grape. It’s one of Italy’s most frequently planted grapes and produces fruity white wines similar to Chardonnay. Italy’s most famous sparkling wine is Prosecco, the country’s answer to Champagne. Prosecco is a bubbly, fruity, aromatic wine. It’s made from the Prosecco grape, which is often called Glera, in the Veneto region near Venice. Prosecco is usually sweeter than Champagne and is consumed at a young vintage. Proseccos produced in the Valdobbiadene sub-region are considered to be of the highest quality and will age well. In addition to Prosecco, there are several other spumantes (sparkling wines) produced in Italy. Metodo Classico refers to wines made in the traditional Champagne method, while Asti Spumante wines are made Moscato – perfect for anyone with a sweet tooth. There's perhaps no other country where food and wine are as essential to culture and tradition as Italy. If there was ever a place to partake in our expertly curated Cruise Global, Taste Local shore excursions, it's here. Browse Italian food and wine-themed experiences here. South America’s most famous wine-producing countries are Argentina and Chile. But, did you know that Brazil and Uruguay also produce their fair share of wine? Argentina is the fifth-largest wine producer in the world by volume. It’s most famous wine, Argentine Malbec, is one of the world’s most popular wines. But the country produces a wide variety of wines in addition to the beloved Malbec, including Tempranillo, Syrah, Cabernet Sauvignon, and Chardonnay. Next door, Chile is known for producing excellent Cabernet Sauvignon and Chardonnay wines. The unique Chilean microclimate is protected by the Andes to the east, the Pacific Ocean to the west, a desert to the north, and the Antarctic to the south. The warm Southern sun and chilly ocean breezes result in fresh, acidic whites and powerful reds. Uruguay is a charming country with great travel destinations like the hip capital city of Montevideo and the swanky resort town of Punta del Este. When it comes to wine production, Uruguay isn’t a major player on the world stage—but it still has an interesting local wine scene worth exploring when you visit. Try bold red wines produced from Tannat grapes, and citrusy white wines made from Albariño grapes. Brazil is better known for cachaça (a hard liquor made from sugarcane), coconut water, and even beer, than for wine. But winemaking in Brazil dates back to the mid-1800s. The country is home to five wine regions, but 90% of production takes place in the southern region of Serra Gaúcha. When you visit, look try their dry Merlots and sweet Moscatos. Like Australia, wine production in New Zealand is a relatively recent endeavor – at least compared to Old World countries like Italy and France. Though the country has been producing wine since colonial times, the industry didn’t begin to gain steam until the 1960s. And it wasn’t until the 1990s that New Zealand began to garner international acclaim thanks to a reputation for producing bright, crisp Sauvignon Blancs. If you like Sauvignon Blanc wine, you’ll love wine tasting in New Zealand. It accounts for over 70% of the country’s wine production. In fact, the country is known as the Sauvignon Blanc capital of the world. New Zealand Sauvignon Blancs are acidic and citrusy with a floral aroma. To fans of the wine, they’re instantly recognizable. Sauvignon Blanc is produced on both North Island and South Island. North Island Sauvignon Blancs are typically from three regions: Hawke’s Bay, Wairarapa, and Gisborne. Due to North Island’s milder climate, these wines are known for their fruity flavors. Sauvignon Blancs from the cooler South Island are crisper and more acidic. There’s so much to see and do while visiting New Zealand, including sampling the wares at local wineries. On North Island, one of the most popular regions for wine tasting is Hawke’s Bay, easily accessed via the port of Napier. In addition to producing Sauvignon Blanc, Hawke’s Bay is known for producing Merlot blends and Chardonnays. It’s New Zealand’s oldest wine region. We love the Church Road Winery, a historic spot that dates back to 1897. A visit to this winery isn't just about tasting delicious wine. It's about understanding the history and cultural relevance of winemaking in New Zealand. And the VIP treatment Azamara guests receive doesn't hurt. Learn more about this shore excursion here. On South Island, the most famous wine region is Marlborough. It can easily be explored from the port of Picton. Marlborough is New Zealand’s largest wine region, with more than three-quarters of the country’s total vineyards. In addition to Sauvignon Blanc, the Marlborough region produces Pinot Noir and Chardonnay. Learn more about the Cruise Global, Taste Local shore excursions offered in the Marlborough wine region and beyond, here. Though Spain may not be as renowned for wines as neighboring France, it is, in fact, the third largest producer of wine worldwide. Furthermore, Spain has the most acreage of vineyards in the entire world, with over a million acres. There are over sixty designated wine regions in Spain, and the country produces a diverse range of wines. Climates and terroirs vary widely across the country: there are lush valleys, volcanic islands, sun-kissed coasts and a warm, dry, central plateau. From exploring organic winemaking to delving into the relationship between food and wine, there's a lot to experience when it comes to Spanish culinary and winemaking traditions. That's evident in the range of Cruise Global, Taste Local excursions we offer in Spain. Perhaps the country’s most famous wine region is Rioja, located in the northern part of central Spain. Rioja grapes are grown across three provinces: La Rioja, Navarre, and Basque Country’s Álava. (You can cruise to Basque Country during a voyage that calls on Bilbao.) The most common grape is Tempranillo, which has been grown in Spain since Phoenician times. Tempranillo is often blended with Garnacha or other grapes to produce wines that are smooth, fruity, and ruby red in color. There are four classifications of Rioja wine. The basic form is Rioja, and these wines have not been aged long. Crianza wines have been aged in oak for at least a year, and in the bottle for several months. More exclusive Reserva wines are made from the harvest’s best grapes during a good growing season. They are aged at least three years total, with a minimum of one year in oak. Finally, there is Gran Reserva. The most elite of Rioja wines must be produced only from the very finest grapes during particularly outstanding harvests. These wines are aged in oak for at least two years, followed by three more years in the bottle. As Spanish wines are less famous than French wines, Gran Reserva is available at a lesser cost than French wines of similar quality and aging. Spain’s famous Cava region, in Catalonia, is where the country’s sparkling wine is produced. Like champagne, Cava must be produced in the traditional method in the nominal region. It can be white or rosé, and is not as nutty as Champagne, and not as sweet as the Prosecco. Sip on Cava while in Catalonia’s largest city, Barcelona. The Mediterranean coast surrounding Valencia is known for its warm, dry climate. Both red and white wines are produced here. Look for the popular Monastrell grape used in reds, as well as Garnacha. For white wine, the Merseguera grape is widely used. Andalusia, located in southern Spain, is even warmer and drier than the Mediterranean coast. This region is renowned for sherry and other fortified dessert wines. Try them when you cruise to southern ports like Seville or Malaga. In fact, wherever you cruise in Spain, you’re bound to enjoy some incredible wines paired with excellent food. It’s one of the best things to do while you're there! One of the added perks of cruising to the world’s best wine regions is getting to sample more wine along your way. After all, shouldn’t your journey be just as enjoyable as your destinations? We think so. Both our boutique cruise ships are home to incredible wine cellars stocked with rare and fine wines from around the world. Our expert onboard sommeliers will help you select the perfect wine to go with your meal. We hope we’ll see you soon!